Yesterday, the Pacific Northwest's own Dr. Jane Lubchenco, a renowned professor of marine biology and zoology at Oregon State University, was finally confirmed by the United States Senate to serve as the new Administrator of the National Oceanic and Atmospheric Administration, the largest agency within the Department of Commerce. Her nomination was agreed to by unanimous consent of the Senate. Lubchenco is the first woman to become Under Secretary of Commerce for Oceans and Atmosphere (the formal job title of NOAA Administrator). 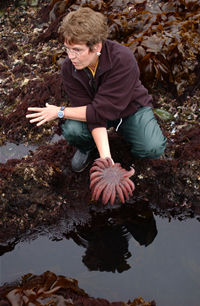 She is also the first marine ecologist to lead NOAA. Her confirmation is exciting news, not only because she hails from the Pacific Northwest, but because she is one of our country's best and brightest environmental scientists. Her responsibilities will be great: NOAA has a $4 billion budget and nearly thirteen thousand employees working in every state, as well as other locations around the world. NOAA's many divisions include the National Weather Service, National Marine Fisheries Service, National Environmental Satellite, Data, and Information Service, Office of Oceanic and Atmospheric Research, and National Geodetic Survey (the government's primary surveying outfit), among others. I am truly honored and humbled to be part of the NOAA team. With hard work and the best science as our guide, NOAA can spur the creation of new jobs and industries, revive our fisheries and the economies and communities they support, improve weather forecasting and disaster warnings, provide credible information about climate change to Americans, and protect and restore our coastal ecosystems. I've met recently with Governor Locke and I can tell you that he is an enthusiastic supporter of NOAA and our mission. As soon as he is confirmed, he will be a terrific Secretary. Locke, Washington State's twenty first governor and our nation's first Chinese American governor, was tapped by Barack Obama to serve as Secretary of Commerce last month. He is likely to be confirmed soon. Like Lubchenco, he comes from the Pacific Northwest, giving the region a strong presence at the Department of Commerce. Lubchenco (pronounced LOOB-chin-ko) takes the helm of NOAA at a time when the agency is poised to play a more prominent role as the Obama administration tackles the issue of climate change. The agency's fiscal 2009 budget stands at nearly $4.4 billion, but under this month's stimulus allocation, NOAA will receive a nearly 20 percent boost -- an additional $830 million. The legislation includes $170 million for climate change research as well as $230 million for habitat restoration, navigation projects and vessel maintenance, along with another $430 million for the construction and repair of NOAA facilities, ships and equipment, improvements in weather forecasting and satellite development. In recent years, Lubchenco - who has conducted scientific studies of how global warming has affected the ocean - has made it clear that she sees climate change as a problem and thinks the federal government should do more to curb human-generated greenhouse gases. In October, she questioned the past administration's approach to the issue, telling the Associated Press, "The Bush administration has not been respectful of the science. But I think that's not true of Republicans in general. I know it's not." The article also mentions that Lubchenco wants to create a National Climate Service as one of her first projects at NOAA. It would be "loosely modeled" on the National Weather Service. (We'll have to make an effort to follow what happens with that idea, it sounds promising). We extend our congratulations to Administrator Lubchenco on her confirmation this week, and our sincere thanks to President Barack Obama for selecting one of our region's best scientists for this important position. The Advocate is authored by the staff of the Northwest Progressive Institute, a strategy center fighting to restore the American promise. Catch NPI announcements and highlights on our Twitter feed. Twitter is also where we publish emergency status reports if the NPI network goes down.